Rows upon rows of solar panels sit on the roof of School 9, one of 17 schools to receive energy infrastructure upgrades. School officials celebrated the completion of the $14.5 million project on Friday morning. As part of the project, 10 school buildings received rooftop solar panels, according to officials. All 17 buildings received LED lighting upgrades and occupancy sensors to conserve energy. Some school buildings received boiler replacement and air conditioning upgrades. Steam traps in all steam schools were replaced and domestic water heaters were upgraded to high-efficiency units. 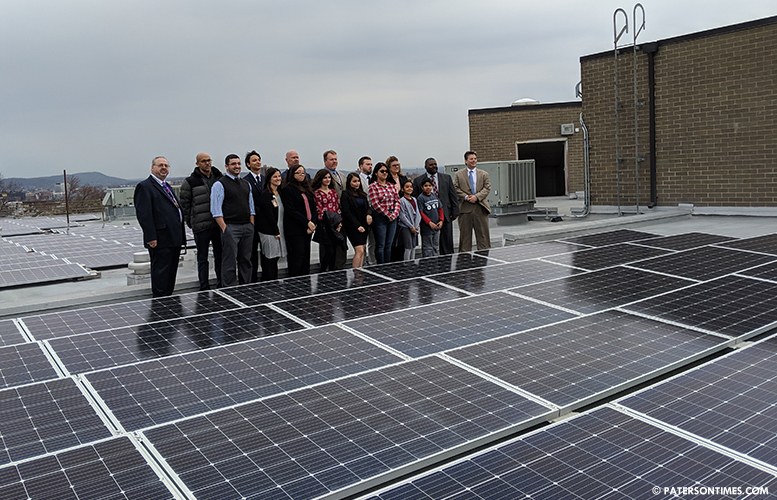 “Lots of energy savings and sustainable energy systems were installed,” said Steve Morlino, director of facilities at the Paterson Public Schools. Morlino said the solar panels will generate 4 megawatts of electricity. He said part of the project included a web-based energy control system. The project is expected to save $20 million in energy expenses over an 18-year period for the district, according to Energy Systems Group (ESG) which undertook the project. Officials said the project started in Mar. 2018. Much of the heavy work was done over the past summer, said Valerie Moran, senior business development manager at Energy Systems Group. Moran said the project is nearly complete. What remains is just air conditioning installation at three schools, she said, which will be finished at the end of the summer. The massive energy infrastructure project was undertaken through the state’s Energy Savings Improvement Program (ESIP). The district did not use funds from its budget to pay for the project. Under state law, the project has to pay for itself through energy savings from the improvements. Morlino said the district is undertaking the largest school ESIP project in New Jersey. He is planning a second phase to upgrade energy infrastructure at the remaining school buildings. The two phases will produce $52 million in energy savings over an 18-year period. Second phase is expected to be completed in 2022. First phase of the project saw improvements at School 1, 26, 2, 3, 4, 5, 8, 9, 10, 11, 14, 15, 19, 20, 21, 24, 25, 27. The project also included an education element. 100 4th and 5th graders learned about solar energy, robot making, and drone flying in a 13-week Saturday STEAM program. “The kids enjoyed every week. They were thinking; they were doing. It was a great program,” said Jeanne Albanese, who teaches 7th grade science at School 9. The students also went on field trips to the Liberty Science Center and the City Growers in Brooklyn to see rooftop gardens. “We had a lot of fun with science,” said Ayman Siddiqui, a fourth grader at School 9, recalling his experience in the Saturday program. “We learned that there are atoms that keep on going and going every time light hits it to generate energy,” said Siddiqui explaining how solar panels collect energy from the sun.